The USB converter designed for use in rugged application area. USB converter adds a Window serial port via its USB connection and can be configured to work with RS-422 and RS-485 peripherals such as industrial control devices. \r\nUSB converter features a full st of RS-422/RS485 data and control signals on its RJ11 jack. It supports data transfer rate up to 3Mbps. No external power supply is required as USB converter takesits power from the USB bus. Effectively turns your parallel printer into a USB printer. Makes connecting your printer easy. USB 2.0 Host Link provides an USB-based networking solution for two or more USB hosts of PC/Notebook. USB 2.0 Host Link is a low power solution with built-in two USB 2.0 transceiver/controllers with embedded ping-pong for optimized output.Through host Link proprietary auto detecting and switching method between USB High Speed. 1ft USB to Serial RS232 DB9 Adapter. The Sabrent USB to Serial SBT-USC1M converter is the perfect solution for transferring data from a PDA or digital camera. The USB to DB9 provides a connection between an available USB port and the more traditional RS-232 serial port found on many devices. This adapter is designed for connections to cellular phones; PDAs; digital cameras; modems; or ISDN terminal adapters through your USB port. Simply plug your device into the adapter and the adapter into your PC or Mac. COM ports and Baud rates can be modified to desired set up. The Sabrent USB to Serial converter is the perfect solution for transferring data from a PDA or digital camera. The USB to DB9 provides a connection between an available USB port and the more traditional RS-232 serial port found on many devices. This adapter is designed for connections to cellular phones; PDAs; digital cameras; modems; or ISDN terminal adapters through your USB port. Simply plug your device into the adapter and the adapter into your PC or Mac. COM ports and Baud rates can be modified to desired set up. Cable Length: 1 ft Cable. Color: Black. Side Male Thumbscrews. 6ft USB to Serial RS232 DB9 Adapter. The Sabrent USB to Serial SBT-USC1M converter is the perfect solution for transferring data from a PDA or digital camera. The USB to DB9 provides a connection between an available USB port and the more traditional RS-232 serial port found on many devices. This adapter is designed for connections to cellular phones; PDAs; digital cameras; modems; or ISDN terminal adapters through your USB port. Simply plug your device into the adapter and the adapter into your PC or Mac. COM ports and Baud rates can be modified to desired set up. The Sabrent USB to Serial converter is the perfect solution for transferring data from a PDA or digital camera. The USB to DB9 provides a connection between an available USB port and the more traditional RS-232 serial port found on many devices. This adapter is designed for connections to cellular phones; PDAs; digital cameras; modems; or ISDN terminal adapters through your USB port. Simply plug your device into the adapter and the adapter into your PC or Mac. COM ports and Baud rates can be modified to desired set up. Cable Length: 6 ft Cable. Color: Black. Side Male Thumbscrews. 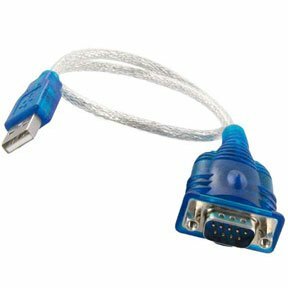 The USB to Serial/Parallel Adapter provides the connection between USB and the traditional RS-232 serial port. The adapter is designed for connections to Cellular phone; PDA; digital cameras; modems; or ISDN terminal adapters through your USB port. Since the adapter uses no IRQs; it is perfect if you need many serial devices attached to your PC. The Sabrent CB-FTDI USB to Serial converter is the perfect solution for transferring data from a PDA or digital camera. The USB to DB9 provides a connection between an available USB port and the more traditional RS-232 serial port found on many devices. This adapter is designed for connections to cellular phones; PDAs; digital cameras; modems; or ISDN terminal adapters through your USB port. Simply plug your device into the adapter and the adapter into your PC or Mac. COM ports and Baud rates can be modified to desired set up. Utilizes the FTDI chipset; plug and play; driverless installation. We have 4 port USB to DB9 RS232 serial adapters, USB to DB25 parallel printer adapters, USB to RJ11 RS422/485 converter, USB 2.0 to centronics 36 printer cable, USB to serial cable adapter, USB to serial cable adapter with screw in different lengths, USB to serial DB9 and DB25 adapters, USB to adapter cable with female hex nuts, USB to serial adapter cable with thumbscrews, USB to female parallel converter, etc.